Last week we returned from one of the greatest family adventures ever. Among the greatest for us, anyway. Along with another family of friends, we took our two youngest for a backpacking trip in Zion National Park. Specifically, we hiked from one end of the Narrows to the other. If you have never visited the Narrows, here’s a snapshot which, even in its beauty, doesn’t begin to capture the spectacular scenery. Now if I tell you that it took us two days to complete the 16-mile hike, you’ll probably think, “No big deal.” That’s sort of what we thought as well. But it turned out to be much more difficult than we would have guessed. For starters, the hike is 16 miles long if you walk it in a straight line—which you can’t. 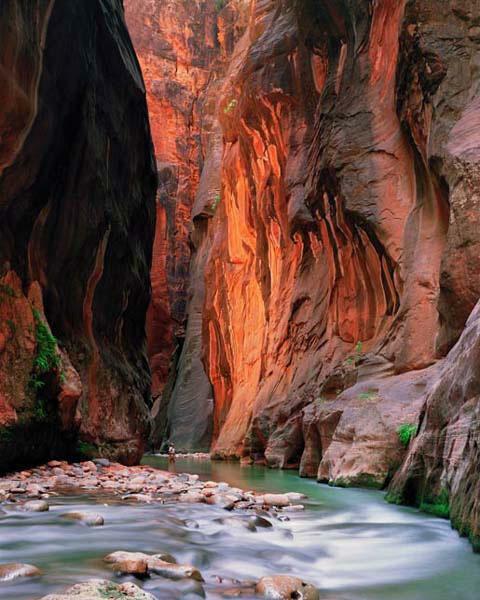 To hike the Narrows, you must crisscross the Virgin River repeatedly throughout the hike, which turns the 16 miles into 25 or 30 instead. Further adding to the challenge, as you proceed downstream, springs and streams continuously add volume to the river, so it gets deeper and swifter the farther along you go. Consequently, as you grow more tired, the invisible terrain on the riverbed becomes more treacherous: the boulders are larger, slicker, and more irregular, the currents stronger, the rapids more frequent. What’s more, as this picture suggests, there are long stretches in which there is no riverbank whatsoever, meaning that you have no choice but to hike in the river itself. That’s not that bad if you are carrying little more than a water-bottle and some trail mix. But since we spent the night at the river’s edge, we were all wearing backpacks, some of us laden with 30 pounds or more of gear and food. That’s not the sort of load that makes it easy to stay balanced while maneuvering over algae-covered rocks in a swiftly-moving, muddy river. In fact, there were many stretches in which we had to cross the river in pairs to keep one another from being swept downstream. There were many areas in which the water was too deep for Seth, my 10-year-old, one area in which all 11 of us were required to swim with our packs strapped to our backs. Ah, life. Strewn with boulders, fraught with peril, harder than we would wish and often not much fun. All the more reason that periodically we should stop and look around, marveling at the miracles around us and relishing the privilege of being here, now, wherever and whenever that might be. In many ways, the ordeal is the point, a challenge for which we should all be grateful. God has said: “Peace be unto thy soul; thine adversity and thine afflictions shall be but a small moment; and then, if thou endure it well, God shall exalt thee on high” (D&C 121:7-8). May it be so.